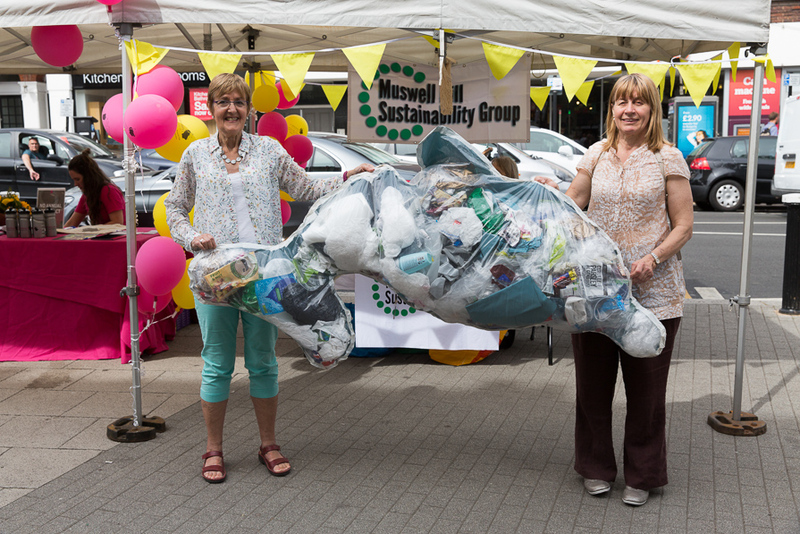 Our plastics campaign dolphin, fast becoming a familiar sight in Muswell Hill, now has a name – Destiny. The name, suggested by a 10 year-old resident, was chosen from 30 entries in a children’s competition as the most apt. The result was announced onstage at the Midsummer Muswell festival on 23rd June, and a £15 token for the Children’s Bookshop in Fortis Green Road goes to the winner. Full of plastic packaging, Destiny symbolises the fate of too many marine creatures. We’re asking local people to pledge to stop using single-use plastics such as cups, bottles, bags and straws which can end up in the sea. There are plenty of reusable alternatives such as bamboo eCoffee cups, metal Chilly bottles, cloth bags and metal or paper straws – or no straws at all! Meanwhile we’re visiting local cafes and restaurants to find out what takeaway packaging they use, and ask them to join the Mayor of London’s Refill scheme by offering free tapwater on request. With support from local people and businesses alike, real dolphins and other marine life may have a healthier destiny.